SANFORD, Fla. After 17 months and three days on the campaign trail, Republican presidential nominee Mitt Romney stood on one more stage in one more battleground state Monday morning, making his final pitch to voters. "One more day! One more day!" chanted a crowd of roughly 3,000 people filling an airplane hangar in Orlando, Romney's final stop in the Sunshine State. Romney surveyed the scene, seeming to soak it in, and called back, "One day away from the first day of a new beginning!" With less than 24 hours remaining until polls open across the country, Romney targeted four crucial swing states that advisers had hoped would be more firmly in his camp by this point--Florida, Virginia, Ohio, and New Hampshire, where Romney owns a vacation home and is well known from his tenure as governor of neighboring Massachusetts. He also added campaign stops on Election Day itself, in Pittsburgh and Cleveland. According to Real Clear Politics' averages of state polls, President Obama had a small edge in New Hampshire and Ohio, and the race was a virtual tie in Virginia. Romney had a slight lead in Florida and was about 4 points behind in Pennsylvania. The gap in Florida started closing after three strong debate performances by Romney in October persuaded many voters, including women and independents, to give him a second look. But even his campaign aides acknowledge that his momentum has flattened--some of it possibly lost to superstorm Sandy. As he has been doing for the past week, Romney encouraged his supporters not only to vote but to also to urge their friends and neighbors to vote. In Lynchburg, Va., he told fans at his second rally of the day that his appeal now is largely focused on those who remain undecided. Laying out the differences between a new start with him or four more years of Obama, Romney elicited a loud chorus of boos at the latter suggestion. He acknowledged that he was preaching to the already converted. "But there may be some people watching who haven't decided yet," he said, "so I'll just note for them that if he were to get re-elected, he will not be able to work with people in Congress." Romney's closing argument includes a promise to reach across the aisle and work with Democrats in the Congress if elected. That's something he says that president has failed to do (it's also something Senate Democratic Leader Harry Reid says won't happen if Romney's elected, either). 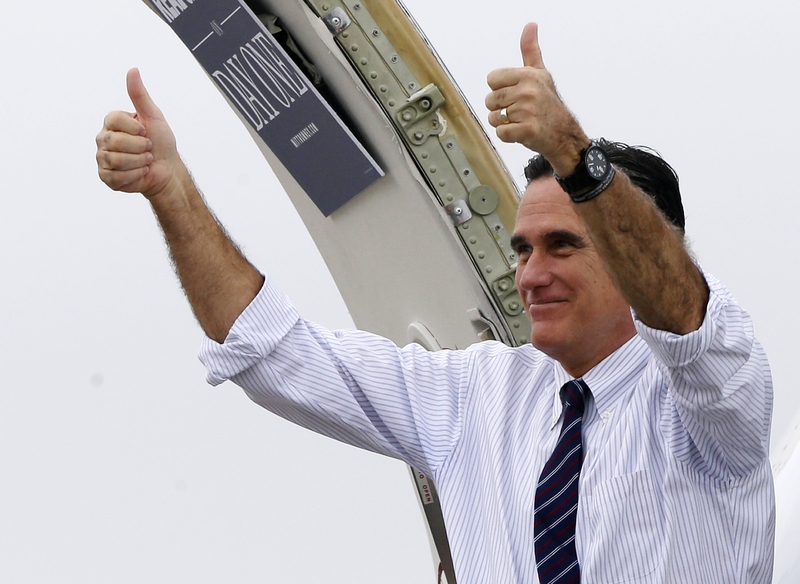 On Monday, Romney warned of a possible government shutdown if Obama is re-elected. Romney held his third rally of the day with a charged up crowd of over 10,000 people at the George Mason University Patriot Center in Fairfax, Va., a suburb outside of Washington. With him were Gov. Bob McDonnell, Senate candidate George Allen and Romney's wife, Ann. The audience erupted into cheers when Ann Romney asked, "Are we going to be neighbors soon?" Her 65-year-old husband, perhaps showing his age, compared the excitement in the arena to a Beatles concert, a reference to the iconic 1960s band. When his remarks were interrupted by applause, Romney said, "I am looking around to see if we have the Beatles here or something to have brought you, but it looks like you came just for the campaign and I appreciate it. ... If anyone out there that's following American politics wants to know where the energy is, just come right here in this room and you'll see it."